Black Lightning and starts from other DC TV series will be at the "DC in D.C." event. The Warner Bros. Television Group and DC Entertainment are bringing out stars from several DC TV shows as well as an exclusive premiere of Black Lightning in Washington D.C. for a pop culture event in January 2018. Below, find the press release with more details. BURBANK, Calif. (December 14, 2017) — Get ready for “DC in D.C.” During the Martin Luther King, Jr. holiday weekend, Warner Bros. Television Group, DC Entertainment and Warner Bros. Home Entertainment will team up for “DC in D.C.,” a landmark pop culture event that brings together the worlds of entertainment and public service to illuminate the story of America and current issues through the lens of comics and Super Heroes. 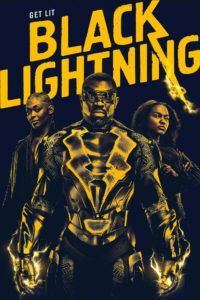 Events will take place Friday, January 12, and Saturday, January 13, 2018, at the Newseum, and will culminate with the world premiere screening of the upcoming DC series Black Lightning — based on the first African-American DC Super Hero to have his own stand-alone comic title — in the Warner Bros. Theater at the Smithsonian’s National Museum of American History, with a party to follow at the National Museum of African American History and Culture. “DC in D.C.” brings together stars and producers from Warner Bros. Television’s DCTV series, as well as comic book writers and artists from DC Entertainment, who will join invited guests from politics, government service, entertainment, business, academia and more. The event will explore the intersection of comic books, culture, entertainment and enlightenment through a series of panel discussions open to the public. Additionally, “DC in D.C.” will present the premiere screening of the DC Universe animated movie Batman: Gotham By Gaslight (for ages 18+) at the Newseum. Executive producers Greg Berlanti and Sarah Schechter (Arrow, Black Lightning, DC’s Legends of Tomorrow, The Flash, Supergirl, upcoming Titans) plus television series stars Caity Lotz (DC’s Legends of Tomorrow), Candice Patton (The Flash), Danielle Panabaker (The Flash), J.W. Cortes (Gotham), Russell Tovey (Freedom Fighters: The Ray) and others to be announced. DC comic book writers and artists such as DC Entertainment’s Jim Lee, Julie Benson, Shawna Benson, Shea Fontana, Agnes Garbowska, Tom King, Steve Orlando, Alice Randall, Oscar®-winning screenwriter John Ridley, Mark Russell, Mariko Tamaki and DC Entertainment’s Geoff Johns, the best-selling author of Rebirth and Doomsday Clock. Stars and producers from WBTV’s DC series Arrow, Black Lightning, DC’s Legends of Tomorrow, The Flash, Gotham, Supergirl and Freedom Fighters: The Ray join comic book authors and artists from DC Entertainment for panel discussions and appearances that are open to the general public. Additional information about tickets for the five public panels will be released at www.DCinDC2018.com. Private, invitation-only world premiere of upcoming DCTV drama series Black Lightning, which debuts Tuesday, January 16, 2018, at 9/8c on The CW. Public sneak peek screening of Black Lightning, as well as the premiere screening of DC Universe animated movie Batman: Gotham By Gaslight, coming to Digital on January 23, 2018, and Blu-ray™/DVD on February 6, 2018, from Warner Bros. Home Entertainment. PLEASE NOTE: Participants are subject to change. Inspired by the landmark one-shot Elseworlds tale by Brian Augustyn and Mike Mignola, Batman: Gotham By Gaslight takes place at the turn of the century as America’s continued industrial revolution is to be showcased at a World’s Fair hosted by Gotham City. But while the world prepares to witness the glittery glory of Gotham’s technological advances, there is a killer loose in the city’s darkest shadows. Preying on the city’s women, this killer is as precise as he is cruel. As Police Commissioner James Gordon (Scott Patterson – Gilmore Girls) tries to calm the fears of Gotham’s citizens regarding the butcher called Jack the Ripper, the masked vigilante Batman (Bruce Greenwood – American Crime Story) indulges in his own detective work — with the help of confident, capable Selina Kyle (Jennifer Carpenter – Dexter) — to stop the Ripper’s murderous spree. Witness a world in flames as the notorious serial killer’s controlled savagery meets the calculated stealth of the Dark Knight. Sam Register, Bruce Timm (Batman: The Killing Joke), Benjamin Melniker and Michael Uslan are executive producers.